This is our New Year’s Eve table for a small dinner party we are hosting. Featured are lots of clocks that will be set to go off at midnight and silver sparkly balls that remind me of the NY ball drop. I also sprinkled polished silver house numbers around the table to remind us of the countdown to midnight. 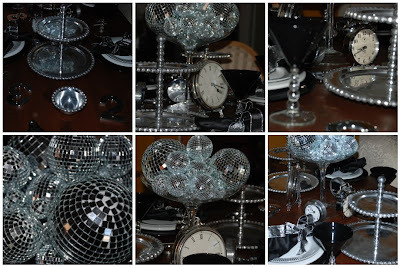 Tableware includes black charger plates, shimmery silverware and plates and black martini glasses with a bubble base. Happy New Year everyone!! This entry was posted in Disco Ball New Year Party, Silver and Black New Year Party on December 29, 2008 by Setting the Mood.